Ragetté Real Estate has a long and storied history extending back to 1885, the same year the disassembled Statue of Liberty first arrived in the New York Harbor aboard a French freighter. In 1879, three years prior to the official opening of Ellis Island, Anton Ragetté made his journey from France to New York. Anton, then a 23-year-old immigrant eventually settled in the Bronx and earned a living doing a variety of jobs. 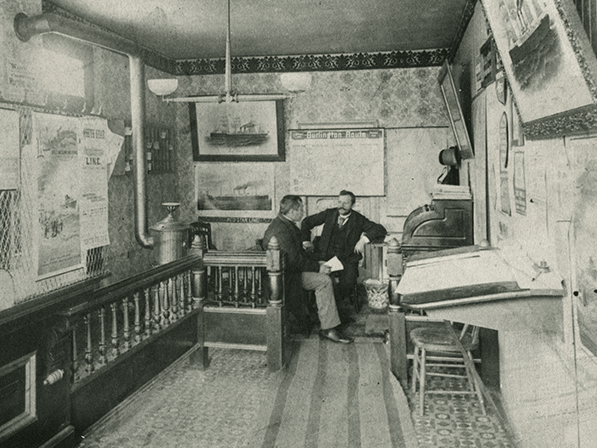 He sold coal, wood, steamship tickets, and real estate from an office he opened on Third Avenue. But it was in 1885 that he founded the present real estate agency and later began building apartments in the Bronx. 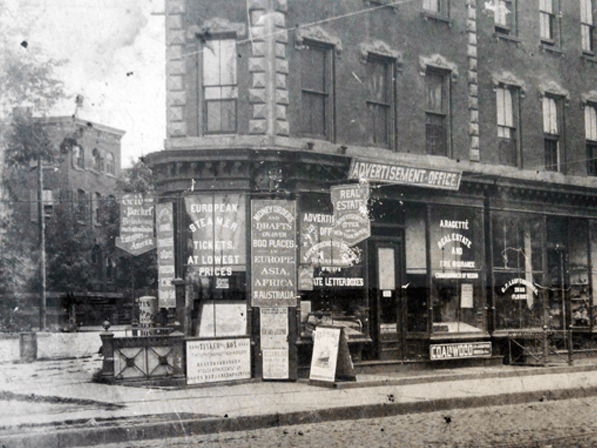 The Ragetté family real estate business had it's beginnings in this building in New York City in 1885. The business was later passed on to Rudolph Ragetté, one of seven children in the Ragetté family. Rudolph, who began his career as a newspaper reporter and later, advertising manager for The North Side News, took over as president of Ragetté Realty in 1918 and moved the office to Mount Vernon. Two years later, Ralph E. Ragetté was born in Mount Vernon. Anton Ragetté (1st Generation) with a client. Anton's rolltop desk remains in Ragetté family today. 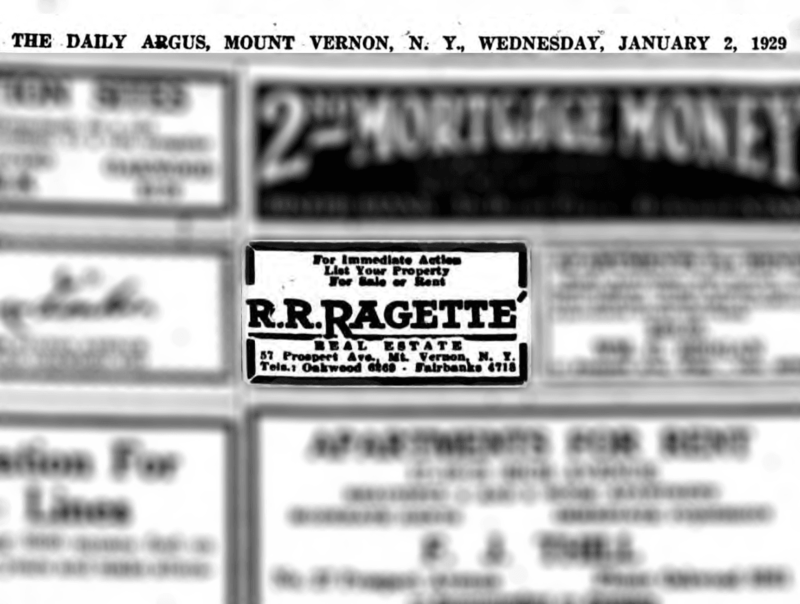 Advertisement by Rudolph Ragette (2nd Generation) in The Daily Argus - January 2, 1929. Notice his 4 digit phone number. In 1938, Ralph, then 18-years-old, received his real estate licensed and joined his father's firm. He sold real estate during the day and took business courses at night at New York University. 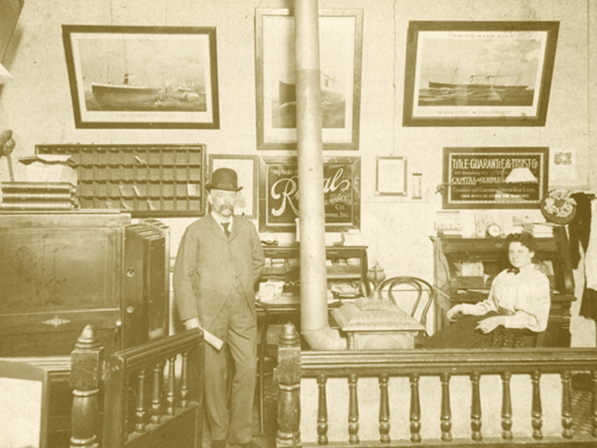 After his father's death in 1941, Ralph and his sister Madeline took over the business. When Ralph left the company to serve in the Army during the war, Madeline continued to operate the business. After the war, Ralph, who by then was married, moved the business to larger quarters in Eastchester and served as President of the firm. In the late 1960's, Ralph responded to the changing trends in the real estate business. He created an in-house training program for sales associates and expanded the firm's business into insurance, corporate relocation and commercial real estate. In the late 1970's, the fourth generation of the Ragetté family joined the firm: Ralph R. Ragetté II as treasurer of the real estate company. 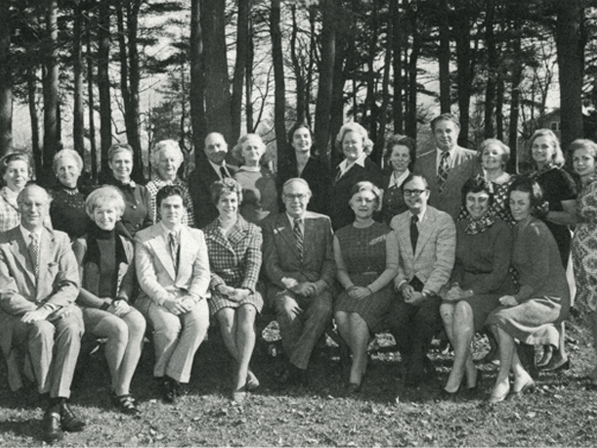 Ralph E. Ragetté (3rd Generation) with the staff of the Armonk office in 1974. 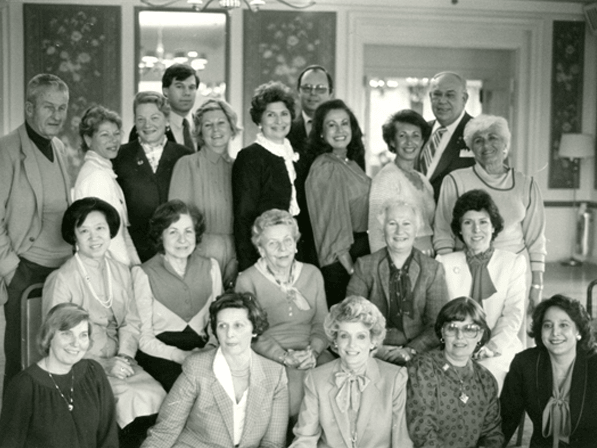 Ralph E. (3rd Generation) and Ralph R. (4th Generation) with the Eastchester office staff in 1981. Today, Ragetté Real Estate continues to provide dedicated and committed service to Westchester and Putnam County homeowners. 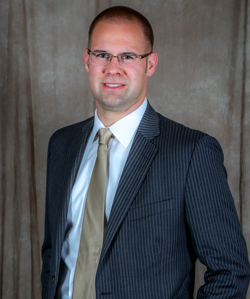 Ralph Ragetté Jr, represents the fifth generation in the Ragetté family-real estate lineage. Ralph R. Ragetté is the current President of the company where he is proudly leading the organization into their 134th year of business.